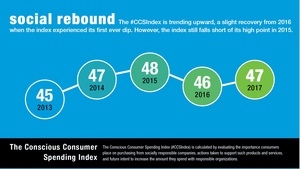 LOS ANGELES and NASHVILLE, Tenn., Nov. 08 /CSRwire/ - Nearly half of Americans (47%) believe the world is becoming a worse place to live, according to the fifth annual Conscious Consumer Spending Index (#CCSIndex). In total, 1,019 Americans were polled this year for the ongoing benchmarking study, which is conducted by Good.Must.Grow. (GmG), a socially responsible marketing consultancy. The 2017 study found that Americans’ outlook on the state of the world has an impact on their socially responsible actions. Those with a negative outlook were less likely to purchase products from social enterprises or “do good” companies, less likely to donate time and money to nonprofits and less likely to report being green in the past year. Those with a neutral outlook were the least engaged. Individuals who said the world was about the same were 19 percent less likely to support socially responsible companies, 16 percent less likely to financially support a charity and 16 percent less likely to volunteer, than those with a positive outlook. Almost 30 percent of consumers said they don’t pay attention to whether they are shopping responsibly. Meanwhile, 40 percent of consumers said the biggest factor preventing them from being more socially responsible was an inability to determine which companies to support. Despite the prevailing pessimism among Americans, the 2017 #CCSIndex showed a slight rebound from 46 to 47 on a 100-point scale after experiencing the first drop in its history in 2016. The #CCSIndex score is calculated by evaluating the importance consumers place on purchasing from socially responsible companies, actions taken to support such products and services, and future intent to increase the amount they spend with responsible organizations. In total, 30 percent of Americans are planning to spend more with companies who are socially responsible in the year ahead. Meanwhile, 61 percent confirmed the importance of buying from socially responsible companies, and 61 percent reported making purchases from socially responsible companies, while 27 percent of Americans report directing at least 50 percent of their purchases toward socially responsible products and services. In addition to the core benchmarking study, this year’s #CCSIndex also featured a separate analysis of the top 50 DMAs across the United States. A sampling of 5,096 Americans was used to identify the country’s most socially responsible big cities. The study analyzed responses to a battery of questions focused on purchasing habits, nonprofit giving and environmental practices. Charlotte came out on top as America’s most socially responsible city. Long Beach, Oakland, Virginia Beach and Seattle rounded out the top five. In specific categories, Long Beach ranked highest for earth friendly practices and had the most conscious consumers, while Virginia Beach was the nation’s most charitable big city. Charlotte’s second place finish in all three categories propelled it to the top spot overall. This year marked the #CCSIndex’s third annual top 20 “Good Company” poll, compiled by responses to the question, “What company or organization do you think of first when you think of socially responsible companies/organizations?” Based on unaided recall by respondents, organizations were ranked based on how frequently they were named. For the first time in three years, TOMS was not the top vote getter, falling to number seven. The American Red Cross headlines this year’s rankings. Walmart surged to number two, while Amazon climbed nine spots to crack the top ten, after entering the poll at number in 2016. For the third-straight year, almost one-third of respondents (30%) failed to name a socially responsible organization. Americans continue to rank individuals as more effective in creating positive change in our society than nonprofits, social enterprises or major corporations. The least effective entity, according to respondents, was the federal government. Only 38 percent rated the government as effective in driving change, down from 43 percent in 2016. This year’s index study saw a slight uptick in charitable engagement over 2016 with more people contributing financially to charities (63%), volunteering time to charities (42%) and donating clothes or household goods (80%). Despite the increase, nonprofits are still seeing a reduction in contributions of time and money within the last three years. People are more likely to use personal research (32%), product packaging (29%) and news reports (27%) to determine which organizations are socially responsible as compared to family and friends (19%) social media (15%) and influencers (10%). Good.Must.Grow. provides strategic marketing support for socially responsible businesses, nonprofit causes and organizations that are focused on health + wellness. We want to be part of a revolution that drives societal change by sparking increased charitable giving and community involvement as well as unprecedented levels of corporate social responsibility. Proud to be a Certified B Corp. See how we’re #GrowingGood at http://www.goodmustgrow.com.